Today marks the 50th anniversary of the assassination of President John F. Kennedy. 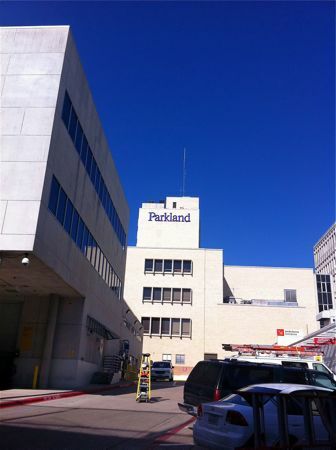 My husband and I recently watched the movie “Parkland”, which gives a new perspective from the medical staff at Parkland Hospital and highlights the famous film footage taken by Abraham Zapruder in Dealey Plaza that day. We’ve also been watching several of the JFK documentaries that have been coming on TV this month. I have learned so many things about what happened that day and in the days following it. I love learning about history, and going to historic places like this really brings them to life. 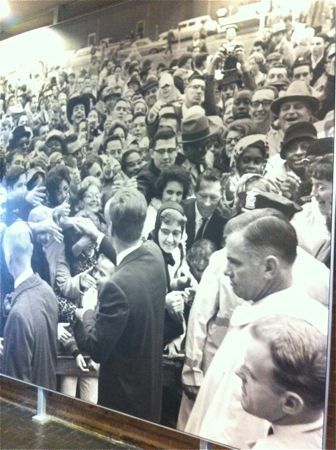 President Kennedy had flown from the airport in Fort Worth, where he had given a speech, to the Dallas Love Field airport. He was met by a huge crowd of people, and he took the the time to shake hands with many of them before he got into the limo to head to the Trade Mart. President JFK’s motorcade was on the way to the Trade Mart here in Dallas to give a speech at a luncheon. 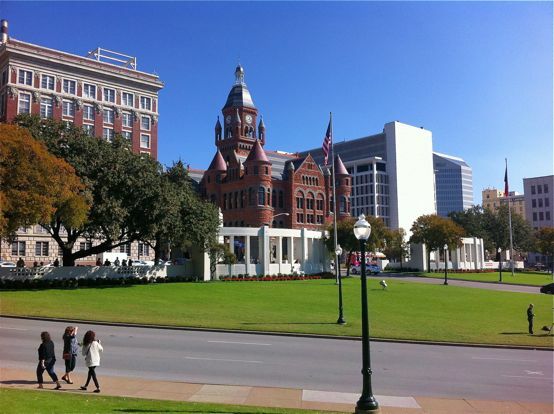 The parade route went through the downtown area and into Dealey Plaza. They turned onto Elm St. by the former Texas School Book Depository. 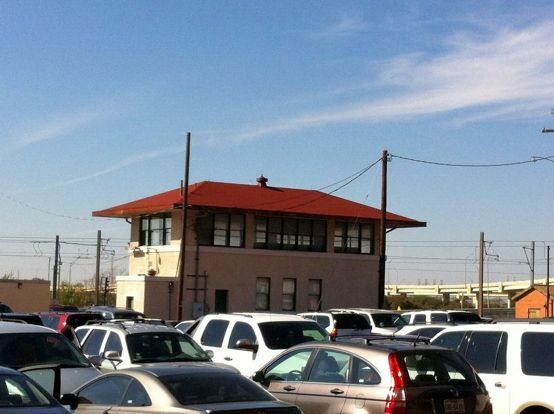 The window that Lee Harvey Oswald allegedly shot JFK from is the sixth floor right corner window in the picture below. Just after those words, three shots rang out. President Kennedy had been shot twice and Governor Connally once. An X (lower right hand corner of this next pic) marked the approximate spot where the president was shot. The road was actually paved over earlier this week, and it’s unclear whether it will be replaced because it wasn’t done by the city. 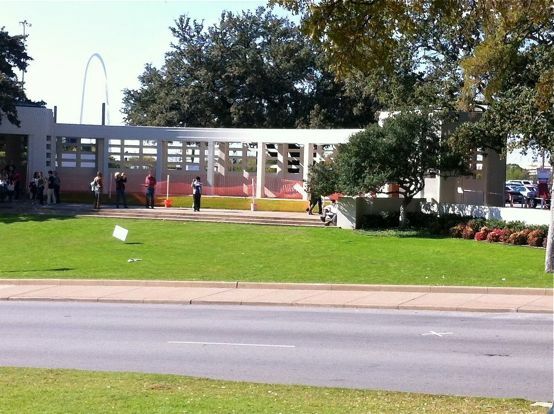 The Presidential limo sped away from Dealey Plaza and under this triple overpass as they rushed to Parkland hospital. President Kennedy was pronounced dead about 17 minutes after he arrived at the emergency room at Parkland. Though critically wounded, Governor Connally managed to pull through. I didn’t even know about this detail until I heard about the movie “Parkland”. I just assumed that he was killed instantly, but the first doctor to see him said that the President had a heartbeat, but no palpable pulse. I also didn’t know that anyone other than JFK had been shot. I don’t know about you, but I love conspiracy theory shows, and there are numerous conspiracy theories out there about JFK’s assassination. 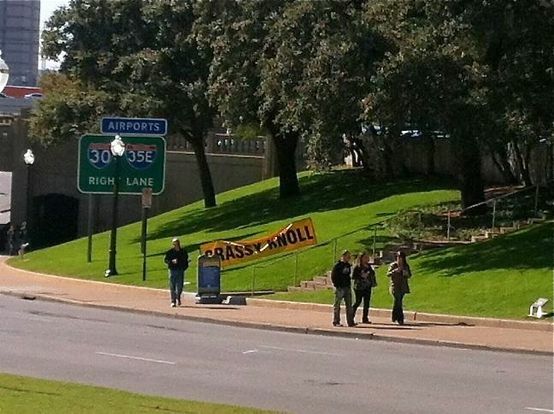 One of them was that there was a second shooter on the Grassy Knoll. The testimony of witness Lee Bowers Jr. added to the speculation of their being a second shooter on the grassy knoll. He was working in this two story tower of the Union Terminal Company Railyard at the time of the shooting and had a clear view of the pergola and the stockade fence at the top of the grassy knoll. He claimed to have seen two men standing near the stockade fence and this pergola at the time of the assassination and to have seen a flash of light or smoke. Fueling this conspiracy theory, was the “suspicious” car accident that killed Lee Bowers on August 9, 1966. His car went out of control and hit a bridge abutment on Hwy. 67 two miles west of Midlothian, TX. I personally don’t really believe most of the conspiracy theories out there, but they do make you wonder. I think that the conspiracy theories will continue on, and I don’t think that we will ever know for sure exactly what happened that day. 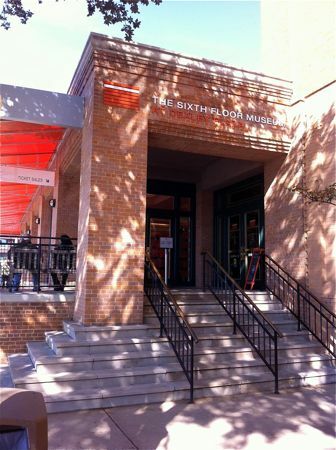 The Sixth Floor Museum entrance. 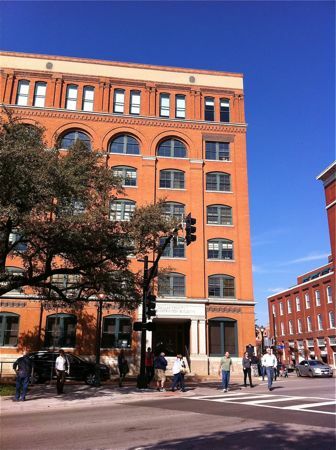 The actual museum is located on the sixth and seventh floors of the building formerly known as the Texas School Book Depository. 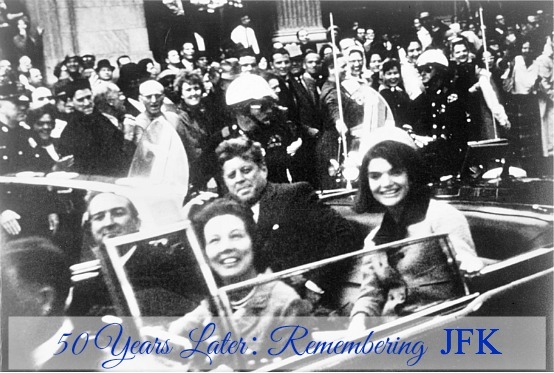 It features films, photographs and artifacts that chronicle President Kennedy’s life, death and legacy. Today, Dealey Plaza was once again filled with a crowd of people who were there to honor the 35th President of the United States on the 50th Anniversary of his assassination here in Dallas. A plaque (which was still covered the day we were there) that sits on the grass in front of the pergola features the final paragraph of the speech that John F. Kennedy was to give in Dallas that day. 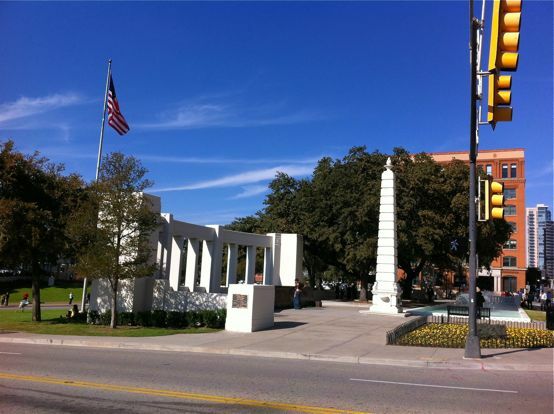 I think that this is a fitting tribute to mark the 50th anniversary of JFK’s assassination and hope that if you ever come to Dallas that you will make the trip down to Dealey Plaza to see it. 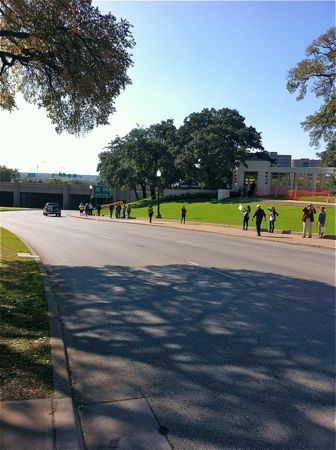 *Edited to add: The X in the road marking the approximate location of where JFK was shot has reappeared. The X was painted on the road by American author Robert Groden, who has written extensively about conspiracy theories regarding President Kennedy. By Tempie at November 27, 2013 .